In his ninth post in the series, Marshall Kirkpatrick focuses on the intersection between artificial intelligence and the Internet of Things. By way of reminder, Marshall launched a 30 day series that explores the intersection between AI and the various innovation components on my emerging futures visual. On June 15th, I participated in an Internet of Things Webcast with CA Technologies. A replay of the event can be found here. The abstract for the session read as follows. In just a few short years, we’ve moved from being a web-economy to an application economy. One of the underlying reasons are thousands of new Internet of Things (IoT) applications, from manufacturing sensors to medical devices, automobiles to homes. Industry experts predict IoT has the potential for an economic benefit of up to $6.2 trillion by 2025. Are you ready to address the fast-approaching era of hyper-connectivity and voluminous data with your business networks? Do you have a strategy to turn your IoT into sustainable growth opportunities? Do you have the visibility to ensure your network can support these new applications and the flood of data that comes with them? Join Frank Diana, Futurist and Digital Transformer with Tata Consultancy Services, to learn the new meaning of having an IoT-connected business in the future. He will be joined by Bernard Clairmont, Presales Consultant with CA Technologies, to explain the importance of having a sophisticated network performance management and diagnostic solution to be ready for the future of connectedness. Like so many emerging innovation accelerators, the Internet of Things will be massively transformative. The time to act is now. 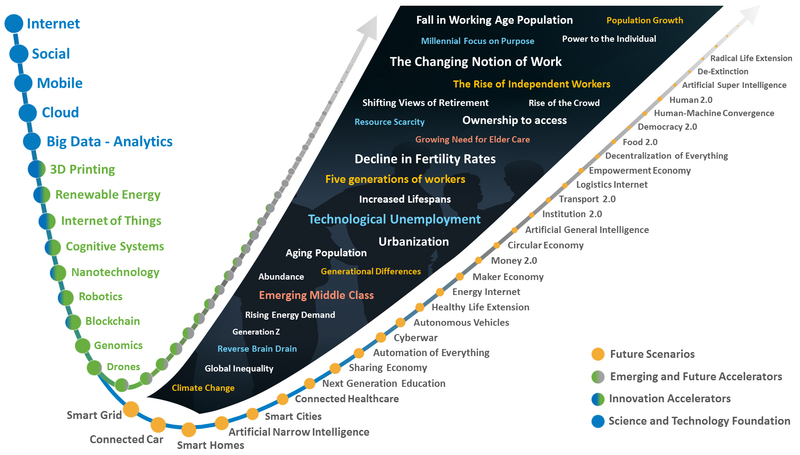 In a recent post, I focused on a series of emerging shifts and the transformation pillars that enable a re-imagined future. In this post, I will dive into one of those pillars: next generation productivity. According to Wikipedia, productivity is an average measure of the efficiency of production. It can be express ed as the ratio of output to inputs used in the production process. In a recent Citi Report, they describe the significant slowing of labor productivity growth, which drives a focus on next generation gains. But In spite of technological progress and innovation, measured productivity growth is low by historical comparison. They cite these growth statistics across advanced economies. The buzz: Wow! McKinsey estimates the 2025 potential annual economic impact of the Internet of Things at $11 trillion, 11% of the world economy. The rebroadcast of the radio show is now available. A deeper dive into the world of the Internet of Things can be found here.